Badge Weight Study - Ysart or not? Topic: Badge Weight Study - Ysart or not? I like the idea that it must be Lead crystal. It does look slightly different to some of the wobbly base ones that were flooding the market. I guess it boils down to the sellers like to use the name Ysart. Grinding down the base a bit could be done at any time and would stop the wobbling and shelf scratching. 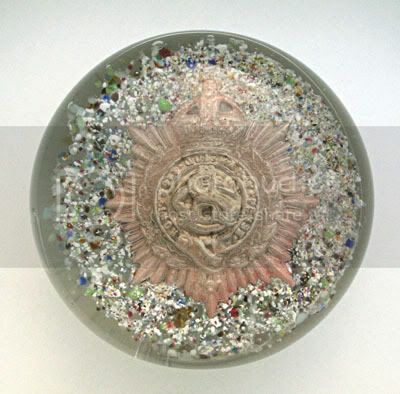 I am happy to add a section to Scotland's glass showing any number of these badge weights, if we can also include any documented makers - plus notes about all of the controversy, at least it will help people to make more informed decisions. I have one, packed away at the moment, that I would say is clearly not Ysart. But in order to put up such a section I will expect a reasonable number of examples... at least ten, preferably 50+. I do not have the time to track them down myself so a volunteer/s to gather the images and write up the notes would be helpful. 3. Base 20-30Â° angle, to show base shaping. On a white or neutral background to help compare the colour and transparency of the metal. Measurements to 1/8th inch (1mm) accuracy and weight. SG if possible. UV long and short, if possible. I have two that are in my "waiting to be photographed" queue. Will send when photoed. Make that 46..I have sent you a full set of images and details for the weight below, save the SG. But it is sodalime glass.....hard and light. Alan has set the standard. Description for each image is seen by hovering the mouse over the image! Alan can you add anything to the description please? Re: Badge Weight Study - Ysart or not? Moderators - can this thread be renamed: "Badge Weight Study - Ysart or not?" The badge is an Army Service Corps badge, of the type used 1901 -1919. The word 'Royal' was added as a prefix in 1918. The Army Service Corps ran the transport system for the British Army, and served during the First World War in many areas including Flanders, now within Belgium. I dont see that knowing the SG of these weights will help this investigation as each has an embedded badge. These badges will not be the same SG as the glass and the badges will have different SG's from each other and will also vary in size.